Homeowners like you take a lot of pride in the appearance of your home, but no one wants to do time-consuming and laborious yardwork every single week. Fill out the form below to let our Top Rated Local® residential landscaping company in Gainesville take care of the work for you! Keeping a well-maintained outdoor space is easier said than done. You can invest in an array of yard working tools, schedule out a few hours of your Saturday every week, and work hard to get your yard looking the way that it should. But why deal with the hassle? Spend your time how you actually want to spend it and rest assured that our residential landscaping company in Gainesville will keep your yard in tip-top shape. Whether you’re in need of a complete redesign, sprinkler installation, property cleanups, or simple recurring lawn care services, we’re the company for you. Get in touch with our team of experienced and expert landscapers today for the worry-free yard that you deserve! Why Choose Our Residential Landscaping Services? Full-service lawn care as low as $25 per visit! There’s no way around it: your yard is a reflection of your home. As the centerpiece of your yard, the health of your lawn can truly determine or at least affect your home’s curb appeal. From strict HOA guidelines to keen neighbors, it’s worth taking the extra time to attend to your home’s lawn. If you’re like most homeowners in the area, then you take immense pride in the appearance of your house — after all, there’s no greater investment or more valuable asset than a home. Why soil your efforts to create the perfect living space by neglecting how the outside of your home looks? Take the worry and effort out of each week with the help of our residential landscaping company in Gainesville. You deserve the perfect home, and the perfect home simply isn’t possible without a well-maintained yard. Continue focusing on family, work, your social life, or however else you enjoy spending your time. Let Gainesville Lawnscaping do the rest! Ultimately, our goal is to make your lawn look as pristine and well-kept as possible. Rest easy and save time knowing that your home’s lawn is in good hands with the dedicated team at Gainesville Lawnscaping. 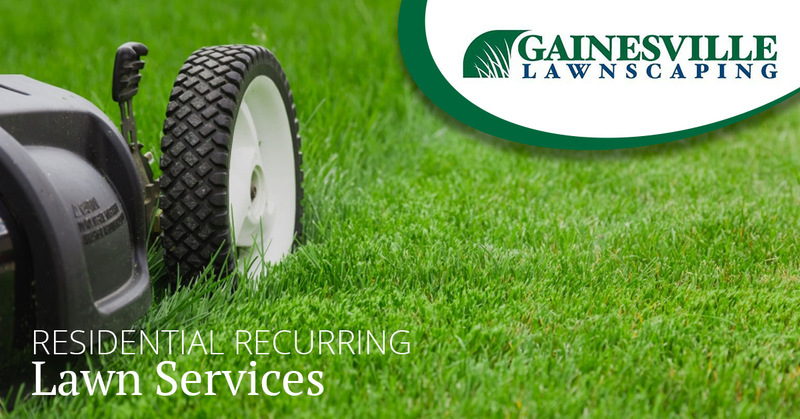 Feel free to contact us for an estimate on our residential lawn care services in Gainesville and the surrounding area!